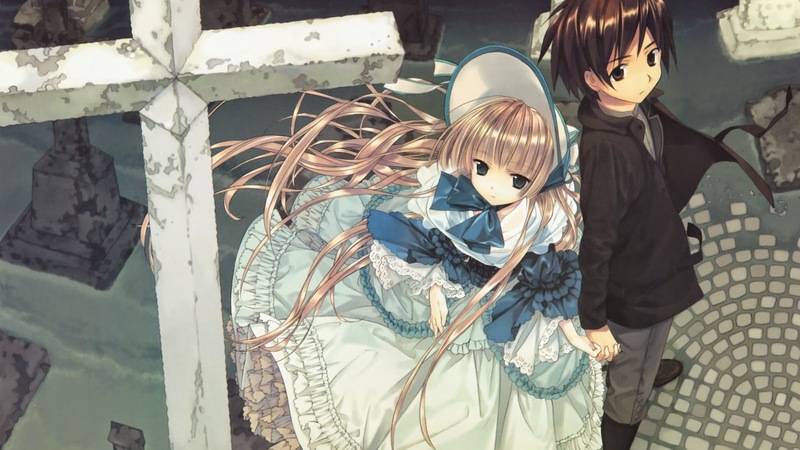 The eyecatch image up there is actually from the light novel series Gosick, which was adapted into one of my favorite anime shows (and which I just found out is no longer free online . . . curses!). Anyway, I thought it made an appropriate header because Victorique and Kujo look vaguely like how I picture Miss Rags and Nicky from my novel in progress, Rag & Muffin. I have just spent the day editing and rewriting chapter eight of twenty. It's coming along. I'll go over it with a red pen and then go on to chapter nine. Once I get through all twenty chapters one-by-one, I'll give the whole thing one more go-through, and then it's time to start my rejection slip collection. It's gonna happen. I can see the light at the end of the tunnel. Recently, I tested the first few chapters on a fresh reader who doesn't normally read science fiction or fantasy. Her response was quite positive. Most importantly, and the main reason I wanted her to try it out, she wasn't put off by all the Hindi and Sanskrit words, which she thought she could understand in context. That was a relief. This book has taken an enormous amount of research, which probably took longer than it had to because I'm both pedantic and disorganized. Much of the editing process has been fact-checking. Last week, I was reading all about sniping or watching videos on the same. The week before that, I was reading about airsoft because I decided to make one of the kids an airsoft player; this gives me a crazier yet somehow more plausible explanation than I had originally for how he falls in with the story's anti-heroes, since he doesn't realize until he's already in neck-deep that the other kids' guns aren't replicas. Probably a bit of Full Metal Panic! influence in there, which I'm okay with, since as a test reader said of an earlier version, the story is "manga up to its bowtie." Then I spent three hours on Friday evening just deciding how one of the sidekick characters, the upper-class British schoolgirl with diplomatic immunity, would sling her assault rifle. Aaaand I actually spent most of the day yesterday trying to figure out the correct word for my heroine's underwear. Great googly moogly, I knew Nineteenth Century fashion was complicated, but that was insane. That was a rabbit hole I was not prepared to go down; I was just sort of like, "Are these bloomers or pantelettes?" And it turns out that's a really complex question. I eventually found some sources that appeared to know what they were talking about, though they didn't entirely agree with one another. Also, steampunk cosplayers don't know crap. Today, I actually got a lot of writing done, but then I was back to double-checking some of the medical stuff. I think I've got a handle on the medical technology for this alternate universe: I didn't want MRIs or CT scans because that seemed too tech-y, so I had them checking a girl for brain tumors with a cerebral angiogram. I hope that makes sense. Whew. Next chapter, I can get back to the parts where they shoot people and break things. Got a scene involving magical transforming mecha and demon-possessed powered armor coming up. I look forward to that. An Evening with the Mormon Missionaries.